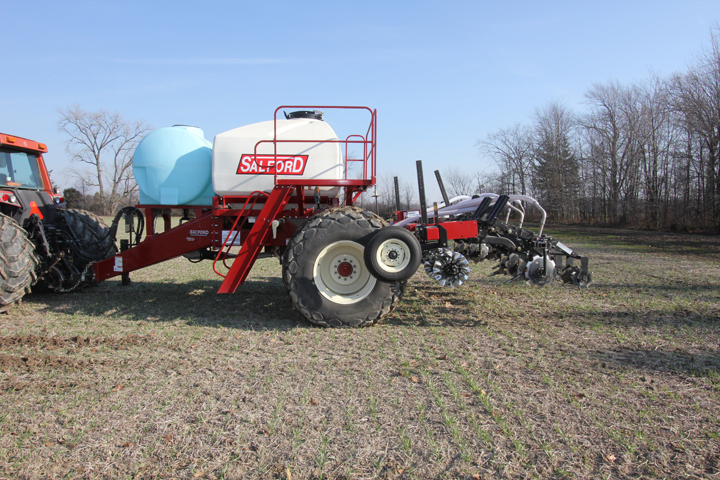 Salford air carts feature poly tanks with stainless steel metering systems for fast, easy cleanout and the ability to hold seed or fertilizer without degradation of the tank. The AC1000 is a single-tank, tow-between model, with 140- or 180- bushel capacity. Farming at its finest! Are you interested in a quote or demonstration of the AC1000? Please fill out the form below and one of our Territory Managers will be in touch shortly. The AC1000 is a single-tank, tow-between model, with 140- or 180-bushel capacity. The AC1000 comes standard with a 17" S3® fan and a Zero Max® infinitely adjustable ground drive. The AC1000 tow-between comes standard with a rear hydraulic three-point hitch to carry seeding or fertilizing toolbars right behind the cart. The AC1000 can also be used to feed planters in order to extend their range or add fertilizer capacity to the machine. safely operate 3-point hitch tools. Front ballast weights are needed when the implement weight is over 3,900 lbs or beyond 18" from the lift-eyes. Prescription mapping and/or auto section control may require software unlock. Ensure latest display firmware version is installed. (Salford, ON) – Salford Group air carts are already well known for their ability to deliver granular fertilizer accurately and reliably but now, the global manufacturer of tillage seeding and fertilizer application equipment is upping the stakes with the introduction of its largest tool to date in the large-scale air cart class, the AC4000 air cart with optional liquid capability. Salford Group Acquires Valmar Airflo, Inc.
(Salford, Ontario) –Salford Group, a global leader in the manufacturing of tillage, seeding, and fertilizer application equipment, is bringing a whole new level of choice to the fertilizer application market through its acquisition of Valmar Airflo, Inc., a leading manufacturer of seeding and granular application equipment for the agricultural industry.